What is Osaka Bio Headquarters? 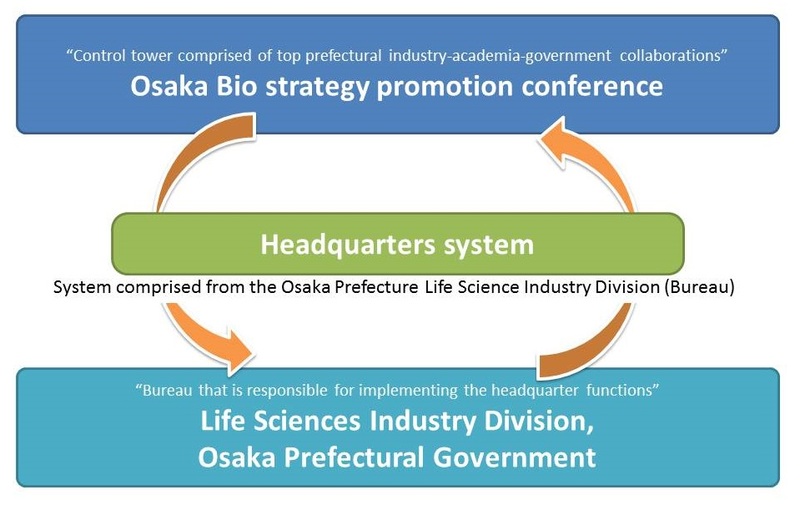 In order to promote the further development of the life sciences industry in Osaka Prefecture, a prefectural industry-academia-government collaboration paved the way for a headquarters system called “Osaka Bio Headquarters.” The headquarters system is a system composed of the “Osaka Bio Strategy Promotion Conference,” the heart of the system, and the “Osaka Prefecture Life Science Industry Division,” a bureau that is responsible for implementing the headquarter functions. ・Has a good command of a wide range of external and internal networks, and strategically implements business developments. Utilizing the accumulated strengths of the industry-academia-government collaborations in the field of life sciences and promoting the creation of drugs, medical devices regenerative medical products and evidence-based health-related products/services, Osaka will aim to support and lead Japan by becoming one of the major bases between the East and West and playing the role of a growth engine and further develop the health and medical-related industries.